Early this spring, Rice University evolutionary biologist Scott Egan stood in a patch of live oak scrub habitat in South Florida and scanned the trees for something he'd never seen outside his lab — a wispy, orange vine twining itself around swollen stems or pea-sized growths on the underside of oak leaves. "I went to spots where I knew that my gall-formers and the vines were, and I just blurred my eyes across the tops of the trees," Egan said, re-enacting the moment he scanned the forest. "And, once you have seen it, you can't not see it. I'm like, 'Oh. It's everywhere. I can't not find it, on this branch, or on this one or this one." "I had never seen this," Egan said. "But the fact that no one, as far as we know, had ever documented this was incredible because biologists have studied each of these — the vines and the insects — for more than a century." In ecological parlance, the find was a new trophic interaction between two species, meaning that one was feeding off the other. "Basically, you have a parasitic plant attacking a parasitic insect inside of another host, a host they share," he said. The new discovery is the subject of a paper this week in Current Biology. Egan, an assistant professor of biosciences at Rice, said the find is exciting because it shows a new aspect of nature that hadn't previously been noticed and because it could offer clues about ways to control agricultural pests and perhaps even fight cancer. "Galls are like tumors in many ways," Egan said. "The wasps induce them to grow at the site where they lay their eggs, but the galls are part of the tree. The cells there have the same DNA as any other cell in the tree. They've just been reprogrammed to grow and behave in a way that is ultimately harmful to the tree. "If we can find out how the vines identify the galls, how they zero in on them, it could potentially provide new clues for targeting and fighting cancer," he said. Gall-forming wasps are among 13,000 insect species worldwide that use biochemistry to trick trees and other plants into growing their nurseries for them. 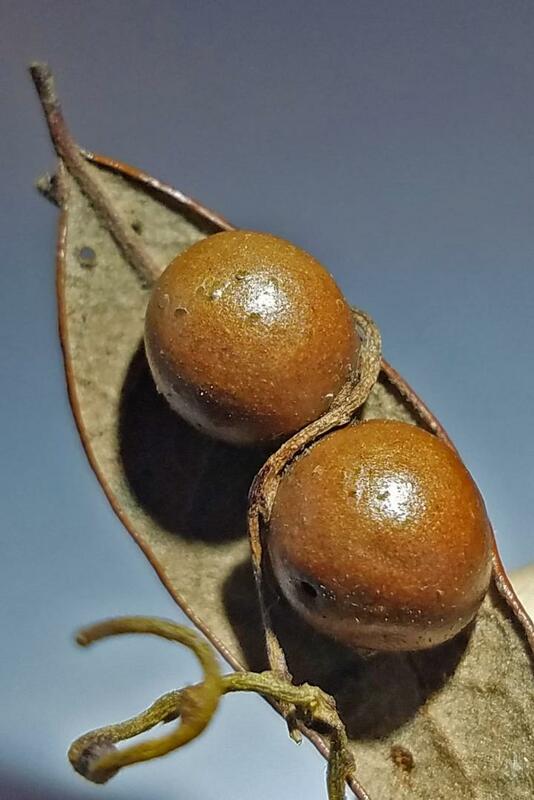 One species that's native to Texas and Florida is Belonocnema treatae, — also called B. treatae — which lays its eggs only on the underside of newly growing oak leaves. A mix of venom and proteins laid down with the egg coax the tree into growing a smooth sphere of hard brown material around the egg. Encased inside this crypt, the larval wasp feeds on a steady flow of nutrients drawn directly from the tree's vascular network, and emerges when it is mature. In the fall of 2017, study co-author Glen Hood, a Rice Academy Postdoctoral Fellow working in Egan's lab, had spent three long days gathering samples over a 1,000-mile route that wound through Florida. "At each site, he finds our gall-formers, collects foliage with our gall wasps on them and seals them in large, 1-gallon plastic bags," Egan said. "There are up to five bags for each site. So he comes back with a bunch of bags, and we get everyone in the lab together to sit around tables and go through each bag by hand, dividing out the galls from the leaves, stems and other material. It takes all day." "I cut it in half, and right in the center was a fully mature but mummified adult wasp," Egan said. "The attacks are also associated with different gall sizes," Egan said. "We found the vines attached to galls that were slightly larger than average. That means the vine is either only attacking larger galls, or the vine is inducing the galls that it attacks to grow bigger, perhaps to draw more energy from them." Egan said the discovery of the new trophic interaction is exciting because it shows an aspect of nature that hadn't previously been noticed and because it's possible that similar interactions happen between many other species. "This is the first time anyone has ever discovered a parasitic plant and parasitic gall wasp interacting on a shared host plant," Egan said. "This could be unique, but biologists have catalogued more than 1,300 species of gall-forming wasps and more than 4,000 species of parasitic plants, so this could just be the tip of the iceberg."